Lenin gives a speech before his mausoleum, while Stalin burns with red-hot envy. CC BY-NC-ND 2.0 Constantin Philippoff / Flickr. Some rights reserved. This is the second in a series of essays by Kirill Kobrin on the death of the post-Soviet project. Read part one here. Stay with us for further installments. Soviet ideology didn’t so much transform as gradually fade away. After all, ideology is never an add-on – it is something that precedes political practice, defining its direction and discourse. It leaves its print on the slightest gesture by rulers and on every response from the ruled. Stalin was the first to deal a powerful, effectively fatal blow to Soviet ideology, by turning a series of temporary measures introduced by Lenin into the basis for his permanent internal and external policies. Lenin resorted to terror to win a civil war, so limiting it in time; Stalin introduced permanent terror. Lenin saw the coexistence of a socialist state with a capitalist world as a temporary measure; Stalin reconstituted the historic Russian Empire and played international politics by imperial rules. Lenin was forced to implement his New Economic Policy, recreating a class-based society and labour exploitation; Stalin created a new caste-based society with an enormous material gap between the new elite and the rest of the population, especially workers and peasants. Lenin, again for tactical reasons, also supported national autonomy movements that destroyed empires; Stalin initiated a nationalist political course – but only for Russians. And in some areas he went further than Lenin: in anti-Semitism, for example, and in an alliance with the semi-official Russian Orthodox Church. But the crux of the matter was that Stalin, for all the pseudo-Marxist babble of his tame ideologues and the grandiose cult of Lenin, attempted to create a new ideology that was not an ideology at all. It was, instead, a combination of political, socio-economic and cultural instruments, picked out of everyday political practice and given the status of fundamental and unchanging pillars of the “state”. The state was key, for Stalin never saw “society” as something with an independent existence. Stalinism tried, and still tries, to look like an ideology, but in fact you are more likely to find it in a ruler’s travelling bag than a library of political literature. And its ruthlessly practical nature has made it much more hardy and resilient than Marxism-Leninism. Soviet citizens were offered not “communism”, but “socialism” – again, something previously seen as a temporary, half way stage on the road to a classless society. Communism was talked about endlessly; the ruling party was the “Communist Party”, but from the early 1930s on, behind all the discussion of Marx and Lenin, a system typical of the time was taking shape. For external purposes, it was a superpower dividing the world into spheres of influence with other superpowers; for internal purposes it was a repressive regime where everything was state-owned and evolved social politics were under constant threat. The following 50 years were devoted to honing these key points, which had no relation to ideology as such. The only blip was Khrushchev’s short-lived but colourful attempt to return the Soviet state and Soviet society to what he saw as real communist ideology. It was this attempt, and not his ridiculous administrative measures and unpredictable behaviour, that was, I believe, the main reason for his fall. The Brezhnev synthesis. CC BY-NC 2.0 Neal Sanche / Flickr. 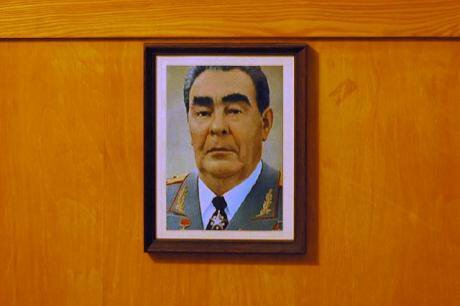 Some rights reserved.The Brezhnev years were a synthesis of these two previous periods – a combination of (watered down) Stalinist principles and Khrushchev’s basically social democratic measures (a massive housing programme and increase in other social benefits, a more egalitarian wage structure). But the main thing was that in the second half of the 1970s the Brezhnev government quietly dropped any idea of aiming to achieve communism. A new concept of “developed socialism” appeared, to be followed by “the perfecting of developed socialism”. Anyone who could be bothered thinking about these new slogans would instantly see that the process they described could go on forever. In other words, communism would never happen. By the beginnings of perestroika, Soviet society had given up on any prospect of communism, so in the early 1980s the idea of a “communist ideology” was also extinct and lay, embalmed in millions of pages of party books and leaflets, in the mausoleum next to its creator. It could have been the final scene from Peter Greenaway’s “The Cook, the Thief, His Wife and Her Lover”. The mummy, however, came in handy during the first years of perestroika. First of all, the legitimate social disaffection of a Soviet population faced with constantly falling living standards was swiftly attributed by the government of the time to “Soviet ideology”, Marxism-Leninism and the idea of communism per se. 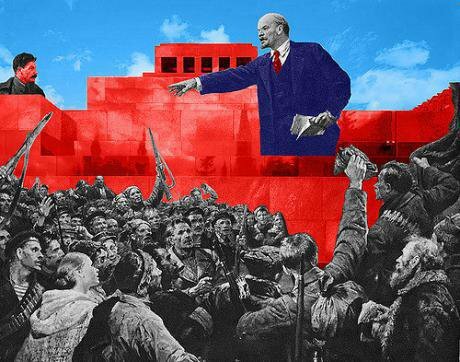 The “protagonists of perestroika” may have initially demanded that Lenin’s pure doctrines be cleansed of their Stalin-era stains, but this process quickly rebounded on the founder of the Soviet state. The sole beneficiaries of this were nationalist movements within the USSR and the enemies, not of long-dead communism, but of “developed socialism”. As well the idealistically inclined intelligentsia, who never suspected that they would lose their own social status and way of life along with the Soviet regime, the main players in the perestroika game were the amorphous “petit-bourgeois elements” to whom the begetters of Marxism-Leninism devoted many pages in their works. Eventually, this element merged with a nationalism more typical of the late 19th and first half of the 20th century, and the USSR collapsed. In most areas of the former USSR, the “post-Soviet project” has been based on these two pillars – nationalism and extreme social egotism, characterised by a surprising blend of embarrassment and awkwardness about their own roots. In the 1990s, both nationalism and extreme individualism bordering on social cynicism were not comme il faut in public life, so fine new, civilised, convincing and right-on expressions had to be coined to distract people’s attention from the only too obvious content of the “post-Soviet project”, and where possible away from the present state of the country and its people. Therefore the attempts initiated by Yeltsin in the 1990s to formulate ideological reference points on which to build a wonderful new life, proposed something beyond this –across either geographical borders (i.e. the west) or time: “the Russia that we lost” – i.e. 1913, before the revolution. This new ideology was, again, not an ideology at all – it was created post factum to justify the state of affairs at the time. In the end – in our 21st century – it is not philosophers, historians or even political scientists that have been required for its creation, but “political strategists”, whose job is to foist their political wares on an indifferent, and sometimes hostile, public. This new type of political product is not an ideology, but some kind of ideological sentiment designed to be inculcated in Russians mainly through the medium of images, on either a TV or computer screen. 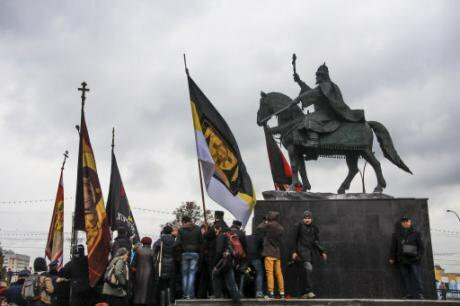 Russia’s first monument to Ivan the Terrible was recently unveiled in the town of Oryol. (с) Howard Amos AP / Press Association Images. All rights reserved.In other words, any talk of a “revival of Soviet ideology in Russia” is meaningless: like Lenin, it can only be revived in some “Lord of the Rings” - type fantasy. What today can be called an “ideological convention of (late)-Putin rule” is merely a public mood sustained in practice with the aid of PR tricks, an amorphous conservative sentiment carefully extracted from any administrative-governmental or economic sphere of activity (which in Russia amounts to much the same thing). What we have here is rhetoric worthy of Russia under Nicholas I, Alexander III or Leonid Brezhnev, slightly updated to match the intellectual level of today’s consumers and fed to them in the form of commercial advertising. In the 1990s, Russia’s “Imperial Bank” commissioned a series of comic TV commercials on historical subjects — with of course, an imperial theme to reflect the bank’s name. Today, this type of advertising, playing with journalism, cinema and literature, is used to advertise the Russian state itself. There is, however, one problem in the way of the Russian “post-Soviet project” as a distinct historic-ideological period. As I have already pointed out, the common perception of a lack of some all-embracing ideology arose out of a desire to hide the true foundations of the post-Soviet society and state – nationalism and petit-bourgeois elements. But this odd political and public embarrassment about its own appearance is now a thing of the past. To speak of a lack of ideology is now quite conventional, not just in “wild Russia” but in “enlightened Europe” and all “democratic states”. There is, of course, nothing new in a blend of nationalism and rampant populism: one has only to remember Marx’s classic analysis of this combination in his essay, “The Eighteenth Brumaire of Louis Napoleon”. This analysis is still considered the foundation of political life in the Western world. In post-war Europe the ruling elites did all they could to, on the one hand, “educate the common man in humanism” and make him (or her) progressive, tolerant and “open”. Simultaneously, they denied the masses any direct influence on political decision making (they were, not without reason, suspected of entertaining destructive emotions).What we now see in the UK, the USA and some other countries is at once the collapse of the “post-war humanist education of the masses” and a catastrophe for the ruling class. Nobody is happier to see this than the Russian government and public. When Donald Trump spouts dangerous nonsense of a type that the average American never imagined they would hear in their lifetime; when the British Conservatives continually push the boundaries of good old xenophobia – why do we Russians need to hide the fact that the only things our country and people recognise are perceptions of our own supremacy and our ability to fleece our weaker neighbour? But there is one serious problem. Both these traits are of no use in relation to the popular issue of our day, national identity, as “foreigners” have them as well. These traits are universal in our modern world, in new and contemporary history. As a result, a new, incredible International of xenophobic “common people” is taking shape before our eyes: an International in which American, British, Czech, Hungarian, Russian, German and many other people are uniting in homespun hatred for one another. As for the recently so influential neoliberalism, globalism and other powerful theoretical constructs of this fading era, they are already being hastily mummified with the works of economists Hayek and Friedman, to be taken to the same mausoleum where two mummies of communism, the physical and the intellectual, have been lying for over 80 years. Missed Kirill's first essay on the death of the post-Soviet project? Read part one here. Stay with us for further installments.